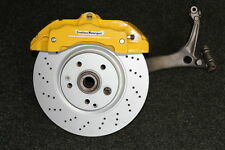 Porsche 996 GT3 6 Pot Avant Brembo Etriers De Freins 997 911 GT2 Turbo 993 RS C.P.N.C. Porsche 996 GT3 6 pot Brake Calipers (pair). Used pair of calipers from a 996 GT3. Will require a refurb, new shims, etc. They would still fit your 996 turbo or GT3. I know a brilliant, and reasonably priced, man with a van who I can get quotes from too. REAR BRAKE CALIPERS PORSCHE 944 S2. ETRIERS FREINS ARRIERE PORSCHE 944 S2. Vends une paire d'étriers BREMBO à 4 pistons pour l'essieu arrière des PORSCHE 944 S2 et PORSCHE 968. 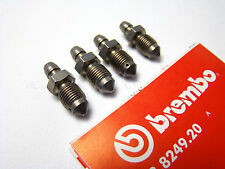 2 x Brake adapters (BR0033). AUDI A4 B5 VW PASSAT 3B BIG BRAKE UPGRADE KIT. Audi A4 B5 and VW Passat 3B. 2 x Porsche to VAG fitting braided brake lines ( Audi A4 to Porsche BL19). Left caliper 7L6 615 123Q. Etrier frein Porsche 911 3.0 SC Carrera 2.7 S 2.0 E ATE. PORSCHE CAYENNE 340CH BOITE AUTO. 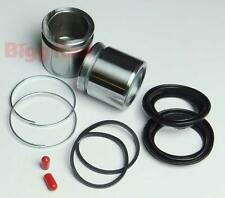 ETRIER AVANT DROIT 6 PISTONS REF.207669901. La référence doit-être identique du DÉBUT A LA FIN pour garantir une compatibilité optimale. Je vends un jeu d'étrier de frein arrière pour porsche 964. jeu composé de l'étrier droite et gauche. en bon état. (sollte in einem Bremsenumbau Verwendung finden). Original PORSCHE Ersatzteil (also fast ) NAGELNEU ! natürlich auch für VW Käfer Typ 1 und 2 und 3 und 4 Tuning Fahrzeuge! (Porsche Bremse in VW Bus Bulli T3 Multivan hinten.!). Gebrauchsspuren vorhanden. Staubmanschetten müssen erneuert werden. Einbauort: Hinterachse links & rechts. Auch sehr beliebt bei umbauten von VAG fahrzeugen auf große. neuer Bremsbeläge. Biete hier einen Satz Porsche Cayenne. Cayenne Turbo S ab werk verbaut. installed an Cayenne Turbo S. Neupreis so komplett bei Porsche knapp 2000EUR. Pair of front brembo calipers removed from Audi Q7. made with love by. Part numbers are 18ZL and 18ZR. All bleed screws are free, not seized. Part numbers are 996351429 and 996352430. Pair of used front Brembo calipers as fitted to all Porsche 996 C4s and 996 Turbo. 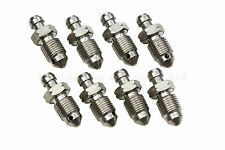 All bleed screws are free not seized. Gerne auch verwendet für Umbauten an VW Käfer, T1 etc. Die Teile wurden vor kurzem komplett überarbeitet, inkl. neuer Dichtsätze und neuem Befestigungsmaterial. Modèle : CAYENNE 4.5I V8 32V TURBO 4X4. Caractéristiques de laPORSCHE CAYENNE sur laquelle nous avons prélevé votreEtrier arrière gauche Caractéristiques de votreEtrier arrière gauche Type Mine . Used caliper from Porsche 993. Common problems on most of the old Porsche calipers. Very nice and clean set without corossion behind the plates. Vw golf/bora IV Gti, Tdi, R32- Audi A3/TT/S3 1.8T Mk1- Seat leon 1.8T- Skoda VRS any 5 x 100 VAG Hub and many more. Porsche 996 Turbo front calipers use 36/44mm pistons. After a careful redesign of our brackets we ended with less weight compare to aluminium brackets we sold previously and yet even stronger ones. 2004-2010 966 Porsche 911 FRONT CALIPER KIT. Make - Brembo. Removed from below vehicle -. Brake Rear Caliper RH. Part Colour. Body Shape. Vehicle Colour. Engines will be sold as photographed (if removed from vehicle). Caractéristiques de votreEtrier arrière droit Code couleur : NC. Couleur : MARRON. Puissance DIN : 400. Cylindrée : 4806. Type Boite : NC - 7 Automatique. Type Moteur : M4840. Carburant : Essence. Original Brembo, 4 Kolben ! Einbauposition - hinten links ( Fahrerseite ). Gerne stehen wir Ihnen zur Verfügung. Im guten gebrauchten Zustand ! 1997-2004 996 Porsche 911 Carrera PAIR FRONT BRAKE CALIPERS DISCS. Part Numbers - 996 351 426 / 996 351 425. The pads will need replaced, there is some heat damage to the seals (see images) Please make sure part is correct before purchasing. We try to describe our parts as honestly as we can, however please also see our images in case we have missed anything. Any questions please ask. International buyers please contact us for price and availability of postage to your location. Removed from below vehicle -. 2002 996 Porsche 911 Carrera REAR BRAKE CALIPERS Discs 3.6 Petrol Part Numbers 996 352 422 / 966 352 421. The pads will need replaced, the brackets have rust on them. Giving these a service/grease wouldn't go a miss (see images) Please make sure part is correct before purchasing. We try to describe our parts as honestly as we can, however please also see our images in case we have missed anything. Any questions please ask. International buyers please contact us for price and availability of postage to your location. Removed from below vehicle -. TRW Étrier de frein 52mm Pour IVECO DAILY PORSCHE CAYENNE DACIA SANDERO BHS790E. PORSCHE CARRERA 911 (996) C4S. Hi, you are buying a genuine pair of Porsche/Brembo brake calipers which were removed from a 2004 Porsche Carrera 911 (996). FRONT BREMBO BRAKE CALIPERS. 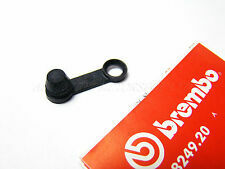 Brake pads & pins not in photos but are included in the sale. Vis de purge étrier de frein 93035191900 brembo. 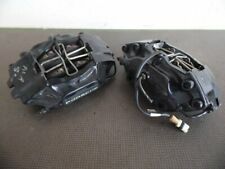 Used front caliper from Porsche Carrera GT. made with love by. PAIR FRONT 6 POT CALIPERS & PADS, USED ON 390MM DISCS. Genuine Porsche pads Nearly New see pictures 11 & 12. Wing Mirror Type. Shelf location: TOP OFFICE. Screws, nuts and bolts are also classed as a free gift if included. They are used and in good condition. 2009 997 Porsche 911 REAR BRAKE CALIPERS Discs Spacers. 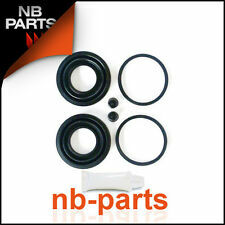 Part Numbers - 995 352 425 / 995 352 426 / 996 352 406 01 / 996 352 405 01. Make - Brembo. Please make sure part is correct before purchasing. We try to describe our parts as honestly as we can, however please also see our images in case we have missed anything. Any questions please ask. International buyers please contact us for price and availability of postage to your location. Removed from below vehicle -. Silver Lacquered Callipers for disc brakes 330mm Rear Right & Left. Removed from a 2007 Porsche Cayenne S 955 4.5 V8 6-Speed Tiptronic, 250kw 340bhp. Porsche Cayenne 955 9PA, 957 9PA1. Compatibility guide . PORSCHE BOXSTER S 3.2 986 REAR BRAKE CALIPERS. USED REAR BRAKE CALIPERS REMOVED FROM A 2002 YEAR 986. Douglas Valley Breakers, Site 1 Bradley Lane, Standish, Wigan, WN6 0XQ. Tres bon etat avec plaquettes. Used Calipers Removed from a Porsche 911 996. Porsche 996 Rear Brake Calipers. PORSCHE 986 BOXSTER. SOLD AS A FULLY WORKING PAIR. HEADLIGHTS RIGHT AND LEFT. HEADLIGHTS THAT WILL BE REMOVED FROM A 3.2S. THIS IS A USED. Hinten LINKS. Porsche 991 718 981 982 970 971.